As responsible citizens who have decided to carry a firearm for self-defense, we don’t choose a handgun because of its superior ballistics. If we anticipate needing a firearm, we choose a long gun if one is available. Rifles and shotguns give us more stopping power and a longer effective range. Unfortunately, we can’t always anticipate the need for a firearm, and we can’t always carry a long gun. 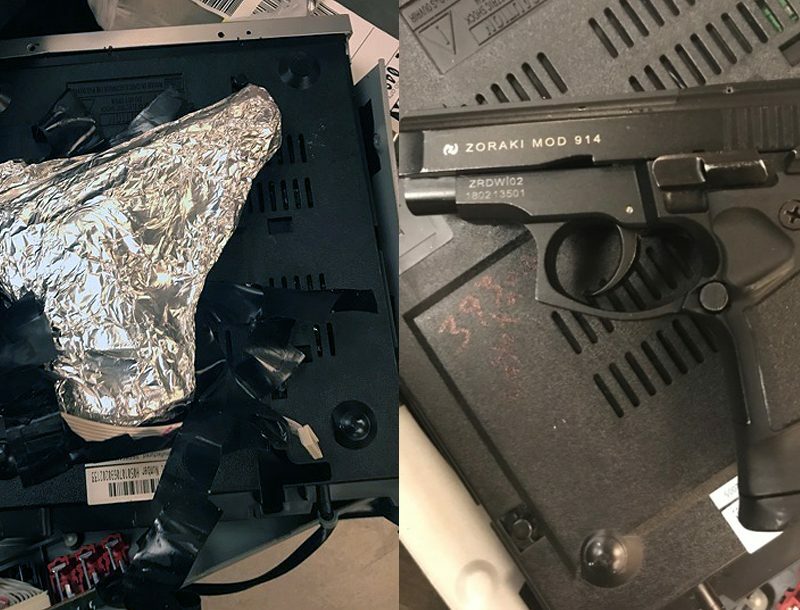 That is why we carry handguns—they are weapons of convenience. Some say the purpose of a handgun is to fight your way to your rifle. But if you can’t get to a rifle or shotgun, you need to know how to fight with your handgun. One essential skill for well-rounded capabilities is long-range handgun shooting. 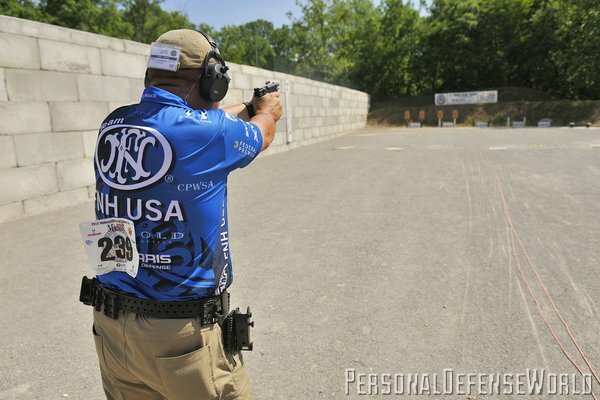 Most handgun training focuses on ranges of 25 yards or less, and there is nothing wrong with that. Most armed confrontations occur within 7 yards. However, on July 29th, 2012, a responsible citizen by the name of Vic Stacy reportedly shot an individual who had Early, Texas, Police Sergeant Steven Means pinned down with a rifle. Stacy shot the individual with a .357 Magnum revolver at a distance that he initially reported as 165 yards. 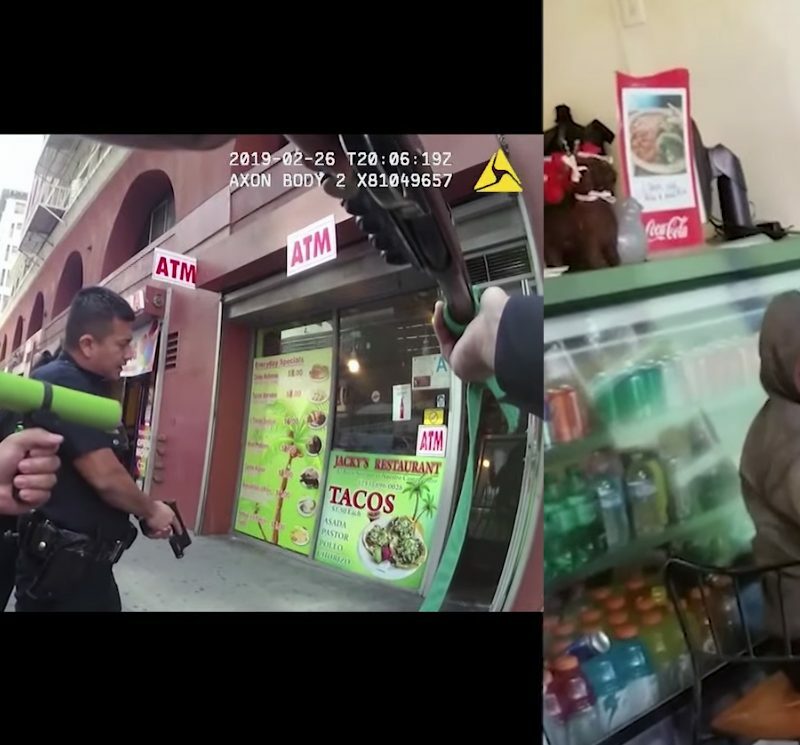 Although there is some question as to the actual distance the shot took place, there is no question that the shot was much longer than a typical handgun shot. Should you expect to be in a similar situation? Of course not. You will most likely be confronted with a close-up threat. Anything further away you should avoid and retreat if possible. However, long-range shooting skills can improve your overall skill set. 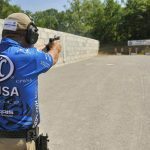 Long-range handgun shooting isn’t another unique set of skills that one must acquire and practice. 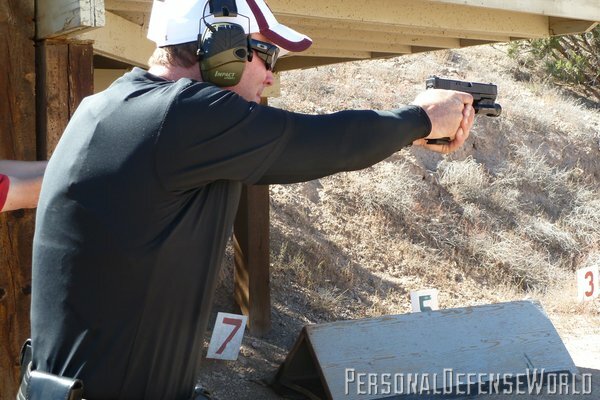 Long-range handgun shooting is essentially the same as precision shooting. The skills necessary to hit a target at 50 yards are no different than the skills necessary to hit a partially covered, head-sized target at 7 yards. It is not only the range of the target that is a factor but also the relative size of the target. When I teach an individual long-range handgun skills, I typically surprise the student by starting very close to the target. My first drill will be a bullet-hole drill. For this drill, the student fires one round at a paper or cardboard target that is only 3 yards away. The hole that the first round created becomes the target for subsequent rounds. Typically I will have the student attempt to put four more rounds through the same hole. The reason I start this close is that I have not yet found a student who can’t at least hit a 2-foot-by-3-foot-sized piece of paper or cardboard at this distance. As long as I can see where all five rounds went in relation to the point of aim, I can analyze the results of the drill. For example, let’s say that the second round is 6 inches below the first round at a distance of 3 yards. The student will see where the round went. I can then explain my observations of the student’s deficiencies to show why the shot went low. Such an explanation might include telling the student I noticed that he or she anticipated recoil and slapped the trigger. Or I may have observed that the student allowed his or her vision to transition from the front sight to the target before the shot broke. In either case, a low shot can be the end result. Now the student knows what to work on and will be able to see positive feedback on the target as a result of improvement. If I had started the student at 25 yards, the round that was 6 inches low at 3 yards would have missed the target entirely at 25 yards. That would make it more difficult to diagnose deficiencies in the student’s shooting and prevent the student from seeing where his or her rounds are impacting. Once the student can make a circular group around the point of aim, it is time to increase the distance. The reason I am looking for a circular group is that it can be attributed to the student’s natural arc of movement. Groups that are linear can generally be attributed to some deficiency that can be corrected before the distance is really increased. Next, I increase the distance to 5 yards and repeat the drill. The student will be able to see the results of his or her shooting, both positive and negative, and be able to learn how each feels. Students will know what it feels like when they are able to execute a smooth press of the trigger and associate that with the positive results on the target. Also, students will be able to see negative results on the target and associate that with how that shot delivery felt. I may repeat the bullet-hole drill at 7, 10 or 15 yards as necessary, but if no major deficiencies are observed, it’s time to bring the student out to the 25-yard line. My preferred target at this distance for teaching long-range handgun shooting is a chest-sized steel plate. 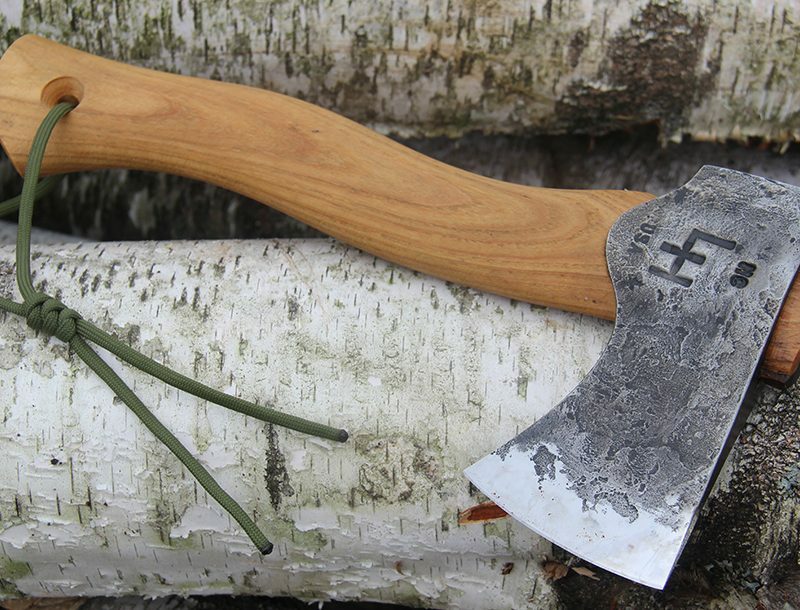 The ringing of the steel is positive reinforcement for delivering the shot properly. The absence of the ringing steel is the negative feedback the student needs to correct the shot delivery process. Once the steel is hit with a high frequency, distance is increased. I continue to use a chest-sized steel target as I increase the range to 50, 75 and 100 yards. Greater distances can be utilized depending on the training environment. 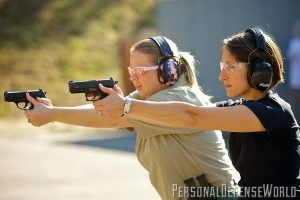 It goes without saying that you should be supervised by a rangemaster or instructor during this type of practice at the range. At ranges beyond 25 yards, I point out to the student that the sight alignment and sight picture may have to be modified slightly, depending on the caliber of the round and the barrel length of the handgun. For example, a 125-grain .357 SIG round is going to have a flatter trajectory than a 230-grain .45 ACP round. My preferred method is to align the sights normally, with the exception of having the front sight post slightly above the top of the rear sights. This allows me to still see the target downrange. Another method is to align the sights normally, but aim higher on or slightly above the target. I personally don’t prefer this method because the handgun can completely cover the target, making it impossible to see. A piece of steel is going to stay in the same place, allowing you to aim at a spot on the berm above the target. A deadly threat will probably not be so stationary. After taking students out to 100 yards, and showing them that they can hit body-sized targets at that distance, I like to bring them back to the 25-yard line. After hitting a target at 100 yards, the same target at 25 yards looks like the proverbial “broad side of a barn,” and students generally come away with increased confidence in long-range handgun shooting, as well as increased confidence in their overall skills. 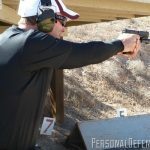 Long-range handgun shooting is just like any other skill—it is something that can benefit you if used properly. 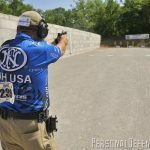 And, viewed in the context of it simply being part of your overall training regimen that will benefit all of your handgun skills, it is definitely something worth considering for yourself. So, go out and see what you can accomplish on the range!